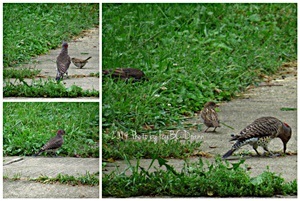 After the rain, I saw a pair of Northern Flickers on the driveway and sidewalk pecking for insects. They are getting very brave being nearby the road too. I guess hunger overcomes fear for any living thing. Not only the Northern Flickers are around but there are other birds feeding right beside them. The Flickers are cool visitors, great photos. Have a happy new week! Lovely photos of nature's feathered friends ~ for OWT!